[London]: H. Humphrey, 1798. Copies held at the New York Public Library, the Beinecke, and the National Portrait Gallery of London. Didelot was a celebrated dancer on the London stage from 1791 to 1801. She, along with her husband, the dancer and choreographer Charles-Louis Didelot (1767-1837), performed in many of the foremost ballets of the day.. Image size 262 x 364 mm., sheet size 268 x 394 mm. 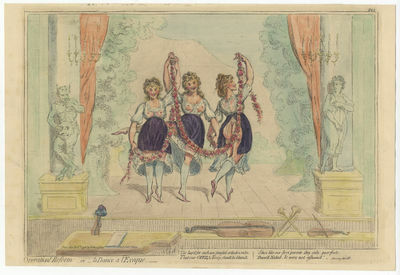 Three versions of Didelot appear on the stage, each holding a different balletic pose and together holding a garland of roses; the two at left with dress including transparent blouse, the one at right turned away from the audience with exposed rear view. With printed text to foot: 'Tis hard for such new fangled orthodox rules, That our Opera-Troop, should be blam'd, Since like our first parents, they only, poor fools, Danc'd Naked, & were not asham'd! - Morning Herald." "448" printed at upper right corner; verso with additional satiricatl engravings suggesting that this may have been a printer's proof.